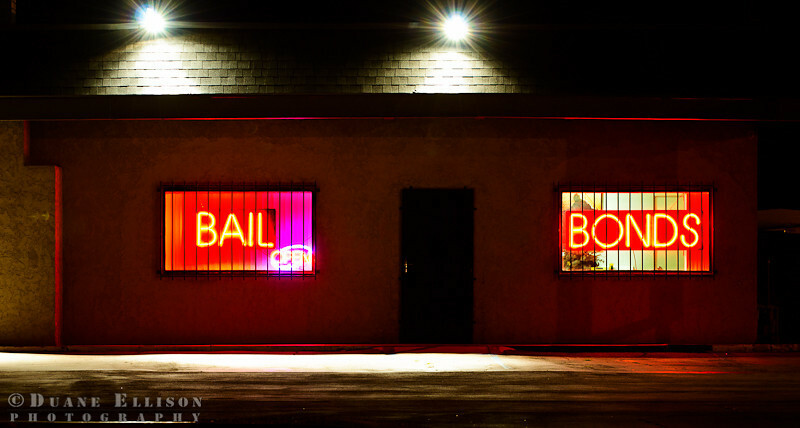 Duane Ellison Photography: Bail Bonds, open for business! Bail Bonds, open for business! I have driven past this place on the way home a few times, especially at night, and I've always wanted to take a moment to try and capture it. So this night I decided to pull over and see what I could do. Night scenes are always a little tricky and with the lights, passing cars (shooting across the road) it was kind of an interesting exposure balancing act. In the end I did get what I was looking for. They kind of messed me up with the flood lights - those where new - but it still worked. Bottom line, and moral of the story, when you see something you want to shoot you probably should stop and do it... Before they add the floods! Cool colors! Your theory is correct; Shoot it before it vanishes or ???. Nice work! See you at the screening! Creating a great emergency bail bonds service business could be a successful path to create cash while doing work that you really truly want to do. There are numerous details to think about before you start.